Ted first commenced woodchopping in 1950 in the South East of South Australia around Mt Gambier and in 1956 stooped woodchopping to concentrate on building his own home. 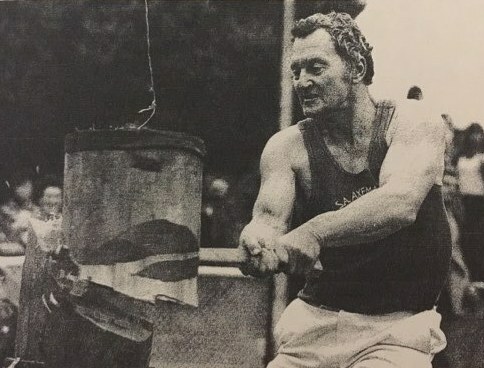 In 1964 he commenced woodchopping again and it was not long before he was the back-marker competing in various events throughout South Australia and Victoria. In 1964, he became President of the South East Axemen’s Association, a position he still hold today and is a life member of that Association. 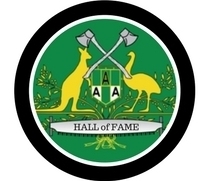 He has also been the President of the South Australian Axemen’s Council. Since 1971, Ted has been the Chairperson of the Mt Gambier Show woodchopping committee and has done a tremendous job in ensuring that woodchopping at the Mt Gambier Show is a continuing tradition. Ted has competed at the Royal Adelaide Show on numerous occasions and was placed in the SA Residents State Underhand Championship and Standing Block Championships. In 1970, Ted was Captain of the South Australian Team that competed in Tasmania and at Brunswick Heads where he won the 300mm Underhand and 300mm Standing Block. Again in 1974, he was Captain of the South Australian Team that went to Tasmania and he finished 3rd in the Government Thousand. During the following years and up until his retirement from competing in woodchopping events in 1999, Ted competed in South Australia and Western Victoria. Ted still has an involvement in the sport by following his son and grandsons who compete in woodchopping events in South Australia and Western Victoria. He also assists by judging some events. Throughout the years, Ted has enjoyed the friendships that he has made with people in the sport of woodchopping.